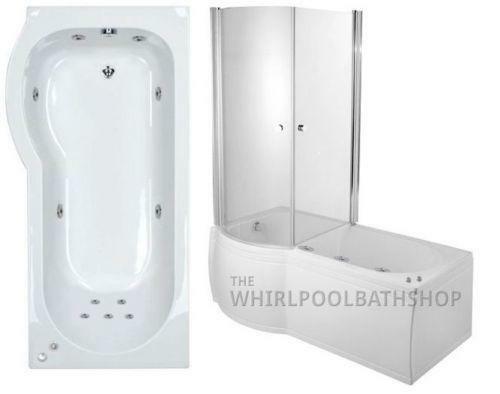 A luxurious P shaped whirlpool shower bath with the addition of an extra screen forming a watertight shower enclosure, a 11 jet whirlpool system is also fitted to the bath should you prefer to enjoy a luxurious soak in a whirlpool bath. Available with or without 2 tap holes. We will confirm with you before delivery. Optional Supercast shell upgrade available. See below for description. If you would like to add underwater lighting, taps or extra jets simply add them to your shopping basket. 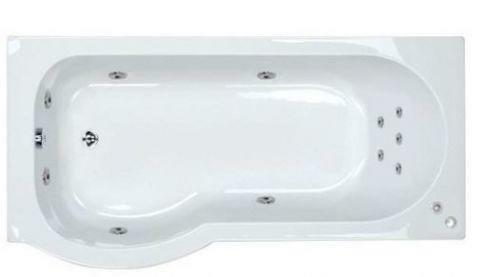 Lighting and extra jets are fitted to your bath and fully tested before delivery. Taps and bath wastes and any other items will be dispatched with your bath. We aim to deliver your bath within 7 working days. Call us Mon - Fri on 0800 028 61874 or 01489 797130 or use the contact form here or use our live chat facility anytime. bath supplied without tap holes, your installer would drill these. We can drill them for £10 a hole if required, we would take payment for this when we book in delivery with you. Pump included, it's a brand new whirlpool bath.